Finding a great nonprofit board chair is crucial to the success of any organization. This is because they take on a great deal of the responsibility on a board. Their duties include delegating and encouraging board members, in addition to giving a sense of identity and purpose to the board. That's why it's so important that an organization makes informed decisions when selecting a new board chair. Mistakes during this process can have siginificant long-term consequences. Who is at the head of your board? Assess the leadership talent of current board members. This will help you determine what kind of personality is needed in the board chair. If you know that your current board chair is planning on leaving soon, ask them to start to identify a list of potential candidates. All board members should get continued training. 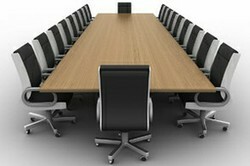 This will ensure your board runs smoothly, making it a more attractive opportunity for potential hirees. To make the transition easier, offer your chair-elect a professional board coach/mentor. Keep morale strong by finding ways to reward board members for what they do. It's crucial that their hard work goes appreciated. Ensure that the board's work is done efficiently. One of the most important skills a board chair must have is the ability to think strategically. They must be able to make difficult decisions in a timely manner, and it's hard to do this without the ability to think outside the box. They must also be accountable for the organization's long-term sustainability. But that doesn't mean the whole weight of the world falls on their shoulders. The ability to be a team player. One of the keys to a successful board chair is having a positive relationship with the chief executive. Excellent communication skills are required. This includes oral and written. A strong personality. Shy people need not apply. Read the latest news about boards and other nonprofit news from our official website. Find the latest nonprofit jobs, or post ones in your organization, including board positions.